Join us for an evening of fun, golf, food, wine, and live music! Nine & Wine is a fundraiser for the Atlantic Area Chamber of Commerce, but it's not your typical golf tournament. 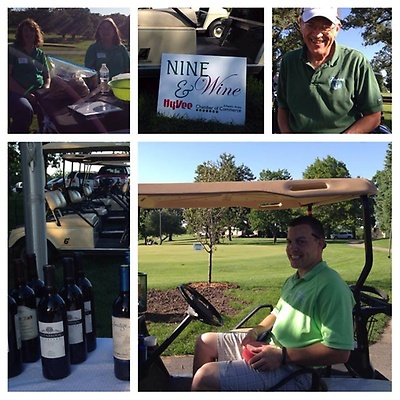 Join us Friday, June 19th, 2015 at the Nishna Hills Golf Course for nine holes of golf, appetizers with a wine or beer tasting at each hole. After golfing, we will be having a Glow in the Dark Driving Contest! After 9 holes of wine and beer tasting you will be served a meal by the Downtowner Café and Catering. There will also be live entertainment from Dirt Road Divide. Rain or Shine- The tournament will be rain or shine. In the case of rain, we will host Wine and Dine and provide dinner, wine and live music. A team of 4 golfers is $200 and includes: 9 Holes of Golf with appetizers and wine or beer tasting at all 9 holes. You will also receive dinner after you golf and two glasses of wine to enjoy while you listen to live music from the local band, Dirt Road Divide. We are in need of lots of great volunteers! You'll be asked to help pour wine at one of the 18 holes from 5 p.m. to approximately 8:30 p.m. For volunteering you get appetizers and wine samples! Bring a friend and stay for dinner for just $10 each. Or Volunteer for the Nine and Wine Event. Contact Ouida Wymer at ouida@atlanticiowa.com or 712-243-3017.